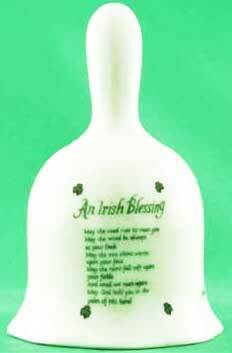 This Irish blessing bell features a double sided design that is enhanced with shamrocks. The 3 3/4" tall x 2" wide blessing bell features a green design on white ceramic; it is suitable as an Irish make up bell. The Irish bell is made in Ireland by Liffey Artefacts and it is gift boxed with shamrock and Irish bell history cards, complements of The Irish Gift House.